Eric knows people under 30? And they listen to him? I can think of a painful compromise of the FOSS software community. And it has a blog. Thanks to Matthew Garrett for script help. I like my music in a round shape with a hole in the middle, standing on my shelf inside a rectangular cardboard or plastic casing. I don’t give a flying falafel about no em-pee-threez. When will the Perelman t-shirts be available at the ELER shop? Noted, Amir; thanks. We’ll *all* know what to buy you for your birthday now. Wow, first time that I saw an I-Pod in the wild. I always thought it to be a myth. I agree. The Perelman t’shirt is sweet. Hey! Somebody got to Digg before I did! Good one. What does the t-shirt say? Pingback: dot unplanned » Give Us Your Codecs or Prepare to Lose the 20-Something Not-Yet-Switched-to-Linux Market for Good! ESR is talking about how the “iPod” generation only wants something that just works. They’ll even shell out $300 for something that is programmed to just work for nine months. The visuals on the comic strip are funny, but your stolen chuck norris jokes are weak. and the content of your script and the remote control being a phone/ipod is half-assed… good day! I think its funny, the remote is just plain funny. ESR was talking about inability to convert music back and forth, not use USB storage. 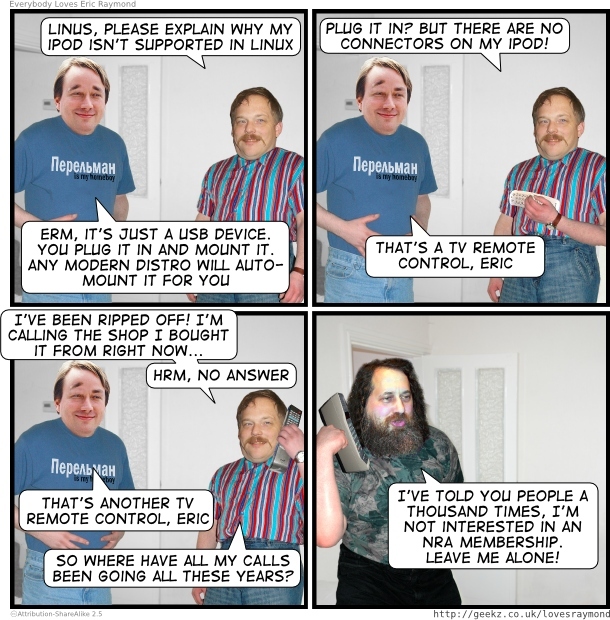 He’s right that Linux doesn’t support it (legally). He’s wrong though about what we need to do. We need to convert content providers to use standards compliant and patent unencumbered formats, then the devices will talk to Linux automatically. Some music stores allow me to chose between Ogg Vorbis and let’s say MP3. That’s progress, but until the choice will be Ogg only, player manufacturers don’t give a… what’s a flying falafel? @Amir E: I get the pi reference. Woohoo, bonus geek points!